I chose the Honeywell 50250s for review because it’s one of the more moderately-priced options for people who simply want to keep the air in their homes pure and fresh without all the bells and whistles. This air cleaner also piqued my interest due to a long-lasting filter that needs to be changed only once every 3 – 5 years. This is a great money-saving advantage. It seems to be equipped with everything necessary to do a good job without any complicated options. It has an activated carbon filter, a true HEPA filter and 3 fan speed settings. Lets take a look. I believe that a good air purifier must do its primary job of cleaning the air – well. Everything else is more or less optional. From everything I’ve read about the 50250s – it would seem that it meets my main criterion amicably. Activated Carbon Filter – The Honeywell 50250s is equipped with a simple activated carbon filter that takes care of the odors, chemicals, gasses, and smoke. This filter is a must-have for any purifier and does its job well. It is mentioned on several medical marijauna forums as one of the best air purifiers for weed smoke deodorization. 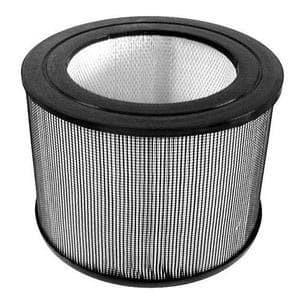 The replacement carbon filters are cheap and will cost you only about $7, but this filter must be changed every 3 months. 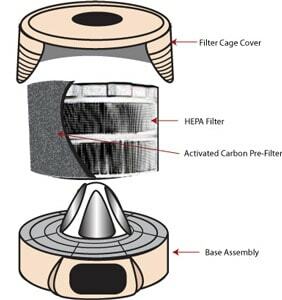 TrueHEPA filter – The HEPA filter that comes with this unit is designed to filter out 99.97% of 0.3-micron particles and larger. This takes care of pollens, allergens, pet dander, and mold spores. The main advantage of this filter is that it needs to be replaced only once every 3 – 5 years, depending on the use. When the filter life indicator tells you that the filter is dirty, you just need to vacuum clean it which takes about 3 – 5 minutes. The replacement HEPA filter is also moderately-priced at around $50. While the filtration system of this unit seems very appealing due to low maintenance cost, I would say that I’m not completely satisfied with the way such a filter works and how long they suggest the HEPA filter will last. HEPA filters tend to grow mold and bacteria on them which can hardly be removed with a vacuum cleaner. The manufacturer doesn’t say anything about anti-bacterial qualities of the filter it installs into this unit. so I would recommend changing the filter at least once every two years in order to make sure that your home is truly clean. After browsing through hundreds of reviews, I found that the filtration system does a good job cleaning the air and making it smell fresh. However, there are a few reviews that showed the unit breaking down after about 2 – 3 years of work. Thankfully, there seems to be a 5-year warranty from Honeywell which we will take a look at later on. When it comes to noise, this unit gets low scores. Even with the fan speed set to low, the noise this air purifier makes is rather loud. Advocates of the 50250s say that it produces a soothing “white noise” which can help lull you to sleep. However, it can also be a major disadvantage for light sleepers. I wouldn’t recommend buying this unit for your bedroom unless you are a very sound sleeper. Brainwave: This Air Purifier would make an excellent choice for a child’s room since white noise is famous for making small kids fall asleep fast! The lowest fan setting produces 49 dB which is comparable to a quiet conversation. This is not acceptable for most people. The highest fan setting is about 62 dB which is comparable to the sound of a loud conversation. This can easily interfere with your reading, working or watching TV. The loud noise can become a problem for people with sensitive hearing since the manufacturer recommends using the unit 24/7. 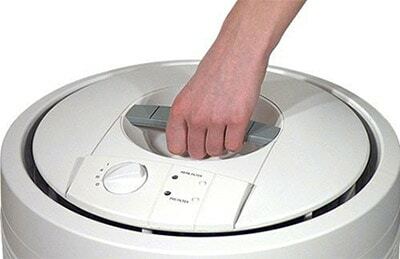 If your household is not subject to abnormal conditions, such as high dust levels due to nearby constructions sites or heavy smoke, then I would recommend only using this purifier for about 12 hours a day, however, when you first turn the unit on, I recommend running it at the highest setting for at least 6 hours to get the fastest results. The design of this model is different from anything I’ve reviewed before, due to Honeywell’s patented 360-degreee air flow system. The intake and release of the air are more efficient thanks to the special design of the unit. However, this system can also be a disadvantage since the 50250-S can’t be placed in a corner or against a wall. Considering the not-so-sleek design, placing it in the middle of the room might not appeal to everyone. I took some time to study the manual and found that the manufacturer strongly recommends installing the unit in a place where you can’t trip over it. This seems rather contradictory to me. On the one hand they are saying it can’t be placed against the wall or in a corner (out of the way!) and the next they’re saying not to put it in the middle of the room where you might trip over it! The 50250-S is far from being small. Its dimensions are 18’’ x 18’’ x 19.6’’ and it weighs about 20 pounds. It does however come equipped with a small handle on top to make the carrying easier. The control panel is really simple. It has a manual fan setting control knob and two filter life indicators and that’s it. Easy to understand and operate, however, the fan setting controller lights up in blue when the unit is turned on which can be a problem if you install it in the bedroom. Many users report that the blue light interferes with their sleep. 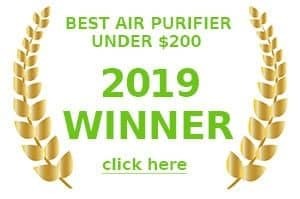 This air purifier is designed to service up to 400 square feet, which makes it a great choice for the living rooms, kitchens, and even basements. The CADR rating for pollen, smoke, and dust is 250. Using the simple formula (CADR x 1.5), we can calculate that the best room size for this air purifier is about 375 square feet. Accordingly, the manufacturer is giving the correct information about the coverage area….which certainly makes them stand out from the crowd! The best results can be reached by running the air purifier on the medium and high fan settings. If run on high setting, you can use it in a larger room as well. However, the noise level might be too much for some people. Personally, I believe that this air purifier is the perfect choice for your basement. It can service a rather large area while producing a loud noise which won’t be noticeable if you use it in a low-traffic room. This unit is not equipped with any sensors that usually come with higher-priced models. However, it does have a filter life indicator which is a big help to any responsible homeowner. Keeping the filters clean on a regular basis is the only way to ensure that your air purifier is working properly. Since the HEPA filter in this unit requires manual cleaning, this indicator is a great advantage. Playing the guessing game with the life of your filter is a bad choice. A dirty filter doesn’t just stop cleaning your air, it starts releasing harmful particles into it. I would recommend cleaning the filters as often as possible. This is especially true for this semi-permanent HEPA filter since only proper cleaning can help you avoid mold formation. While doing the research about this air purifier I found a few reviews that talked about the breakdowns. The unit seems to work fine for about 2 years, but some people have reported that it can develop some problems. That’s why the 5 – year warranty by Honeywell is a big advantage. I took a closer look at the details. The warranty is pretty straightforward. It covers replacement and repairs of the unit if the material or workmanship defects are found. The owner will need to pay a shipping fee for sending the defective unit to the manufacturer and then for getting the repaired or the new one back. This will cost you about $20. The warranty is valid in the U.S. and Canada only. After doing extensive research I’m ready to recommend this unit to people on a tight budget who are not sensitive to the loud noise. As mentioned above too, it would be a good choice for a child’s bedroom as it emits a decent amount of white noise which has been shown to help lull children to sleep. Essentially, the Honeywell 50250s is a budget model that does a good job cleaning large areas without the fuss. There are a few disadvantages, such as high energy consumption or lack of sensors. But overall, this is a solid unit that can be a useful addition to any household. 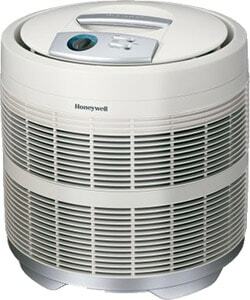 The Honeywell 50250s air purifier has been around for quite some time, but it still offers superb value for money which I decided to give an updated review on it for 2017. Still holds it’s own even against newer competition.